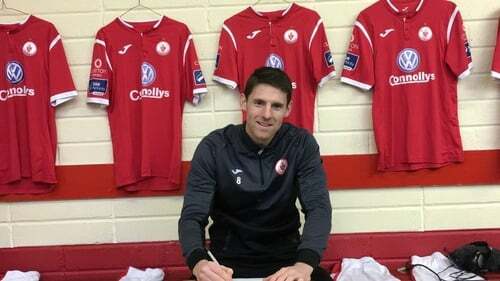 Daryl Fordyce: "Family always comes first for me,"
"It's great to be home," says Sligo Rovers latest signing Daryl Fordyce. It's also a positive end to what Fordyce describes as the "toughest but happiest" year of his life. The 32-year-old is back in Ireland after six years in Canada playing with North American Soccer League outfit FC Edmonton. In November 2017 the team folded, and versatile midfielder Fordyce was weighing up his future. Clubs in Scotland and Northern were interested in the ex-Linfield and Glentoran man and a new switch looked imminent. "I'd been playing in Canada and America for the last six years," he told RTÉ Sport's Darren Frehill. "I was to come back at the start of June. I'd a club in Scotland looking at me, a couple of clubs up north. I was back home at the end of May doing coaching badges and was to get a club sorted out so when I went back to Canada I could tell my wife, 'this is where we're going'. "While I was doing my badges my wife Facetimed me. She was in hospital, she was pregnant at the time and the doctor told her she was unable to fly. I had to book a flight back to Canada and stay there until the child was born. It meant I was out of football for a year." The new arrival threw a spanner in the works but Fordyce wouldn't have it any other way. His son arrived, he hit the gym to stay in good condition and, just in time for the new Airtricity League Premier Division season, Sligo Rovers came calling. The Bit O'Red kick off their campaign under Liam Buckley against Dundalk and Fordyce can't wait to get a taste of what he calls the "nitty-gritty" side of the game again. "Family always comes first for me," he added. "We welcomed a beautiful baby boy into the world, 11lbs 2oz - a big boy. He gave my wife a tough time in the hospital. It was probably the toughest, but the most happiest year of my life. "I'm glad to see the back end of it and I can't wait to get going. "I've been welcomed at Sligo very well. It's like a family environment. The club has been tremendous. "Most fans just see the players on the pitch and judge them on what they do on the pitch. Rightly so. But outside of it, especially playing on the other side of the world and having a baby... it can become tough. "Once you get settled again, you train and you're in a football environment, all your life's worries disappear. "I just want to do the best I can. It's great to be home."